The ubiquitous barcode scanner has been with us for decades. It fills the need for accurate, timely capture and use of inventory data, with applications from the checkout stand to the complex inventory management systems of major corporate and government organizations. It has rendered obsolete armies of inventory control clerks with clipboards and pens, retail clerks holding up lines as they search for item prices, and supply chain management nightmares with over or under ordering of needed parts and supplies based on guesstimates of on-hand stock. Error reduction – Transcription and recognition errors are banished. Manual entry via a keyboard, for example, generates ten errors for every one thousand keystrokes. Optical barcode scanning suffers from only one error for every 10,000 scans. Productivity Improvement – Barcode systems reduce personnel overhead and lessen training time. They allow immediate implementation of any changes to pricing entered into a company’s database. Asset Management – Barcodes are the heart of any robust asset management and theft deterrence system. Properly implemented and managed, they are the basis for improved security and asset tracking across a wide range of industries. The laser barcode reader works well with 1D applications; such as the UPC-A codes widely used by the retail industry and grocery firms. It adapts to distances up to three feet and works well in areas with poor lighting. 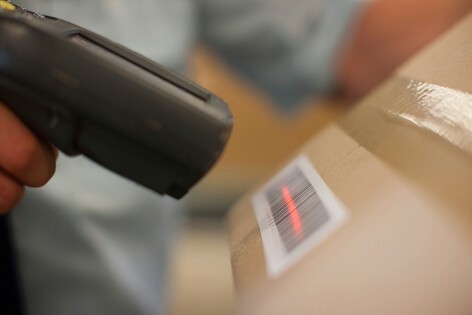 The laser barcode reader accomplishes its scanning in one of three different ways: by rastering (capturing lines that cover the scanned area), moving beam (the laser moves across a UPC area a single line at a time), and omnidirectional (multiple beams read barcodes at different angles). Barcode scanning systems quickly pay for themselves and even prevent life-threatening incidents. A dramatic case in point: a hospital pharmacy implemented a barcode-based inventory management system. It invested $2.24 million over five years. An analysis by the National Institutes of Health found that the hospital saved an estimated $3.49 million over those five years. Of that amount, the primary savings was realized through the avoidance of improperly dispensed medicines. Without barcoding, the study determined there would have been 517 potentially fatal errors annually. The break even point for the barcoding system implementation was after the first year. There are several types of barcode scanners available. All read the black and white striations that comprise a barcode. This combination represents an item’s unique identifying attribute, typically a combination of numbers and letters. Capturing this data, the barcode either decodes it internally or sends it to an external decoder. We Wish You a Happy Birthday, Barcode!